Motorola announces the Charm QWERTY Android Phone with physical keyboard | Android Blast! Android users waiting for a portrait QWERTY (BlackBerry-style) device are rejoicing. Motorola has officially announced the Charm, an Android phone with a physical keyboard. 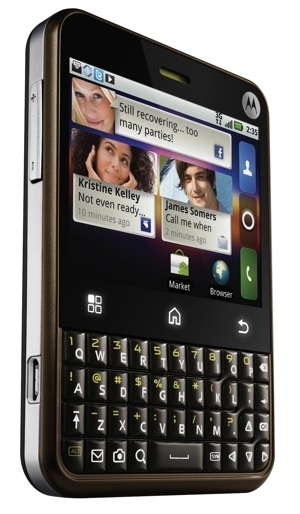 The Charm not only features a QWERTY keyboard, but a touchpad on the back of the phone for navigation. It has a 3 megapixel camera and 2.8" display. It will ship with Android 2.1 with MotoBlur, but will hopefully be upgraded later. Libertyville, Ill. � July 7, 2010 �Motorola (NYSE: MOT) today announced the upcoming availability of Motorola CHARM�, a touch screen smartphone that packs a social networking punch with Android� 2.1, MOTOBLURTM enhancements, a compact design and a BACKTRACK� feature that makes screen navigation even more intuitive. Motorola CHARM is expected to be available this summer exclusively in the U.S. for customers of T-Mobile USA, Inc.
Motorola CHARM provides consumers all the features of a smartphone with the intuitive navigation of a 2.8 inch touch screen � all in a compact, pocketable design that makes messaging a snap using the combination of a full QWERTY keyboard and touch screen. The BACKTRACK navigation pad, located on the back of the smartphone directly behind the home screen, is similar to a laptop touch panel and enables an unobstructed view of the Web, texts, e-mails and news feeds. Plus, with Android 2.1 and enhanced MOTOBLUR features, CHARM offers new customization and filtering options. Motorola CHARM will be the first device in the U.S. to feature an enhanced version of MOTOBLUR built on Android 2.1, which syncs contacts, posts, messages, photos and much more in easy to manage streams � from sources such as Facebook�, MySpace, Twitter�, Gmail�, work and personal e-mail. MOTOBLUR now allows for even greater customization, providing users more options to follow who and what really matters. MOTOBLUR filters can be selected from a single social networking account, contacts, group or messaging account so that users can select only the information they want to stream live to the Happenings and Messages widgets. Users can move and resize pre-loaded home screen widgets to personalize up to seven home screen panels for an even more custom experience. Lastly, consumers can manage their phone�s battery consumption by selecting different power modes to conserve battery. Last, but not least, Moto Phone Portal enables you to access and manage your phone�s data from any browser through a USB or Wi-Fi connection. Edit content and view important phone information while at home or on-the-go. Leave pictures on a friend�s PC, share a video at the local Internet caf� or share a presentation during an important business meeting. Motorola CHARM with MOTOBLUR is expected to be available exclusively to T-Mobile USA customers this summer. For more information on Motorola CHARM with MOTOBLUR, please visit here. To view images please visit here.